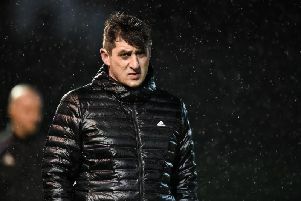 Rodney McAree believes Dungannon Swifts must approach their upcoming Irish Cup semi-final against Linfield with confidence, not fear. The sides will do battle on April 1st for a place in the biggest game of the season - Dungannon’s first last-four clash since 2012, when they lost out to Crusaders. The Swifts have a poor record against Linfield. They haven’t beaten the Blues since November 2013 and have suffered two heavy defeats already this term. But McAree insists: “It is one to look forward to. If you get to a semi-final you don’t care who you get, it’s always going to be very difficult. Dungannon needed extra-time to beat Warrenpoint at the weekend. They fell behind in the 55th minute when Aaron Traynor scored a close-range header. But an own-goal from Jordan Dane brought them level. Douglas Wilson then scored three minutes into extra time to send them through. McAree admitted Warrenpoint had been tough opposition - but was not surprised by their performance. “It was hard work, we always knew it would be,” he said. “First and foremost we had to make sure we worked as hard as Warrenpoint, if not more. Warrenpoint boss Matthew Tipton could take little comfort from a narrow defeat. He felt his side didn’t impose themselves on the game, and did not show enough fight in the closing stages. “We felt sorry for ourselves,” he admitted.